Photo: SSO/Thatcher perform Schultz’s Endling in Newcastle 2016. New work – Cantata (libretto, Katherine Firth). St John’s Camerata and Choir, St John’s Southbank, Melbourne, 3 December 2017. WP. Maali – Concerto for oboe, clarinet, horn and bassoon. West Australian Symphony Orchestra conducted by Simone Young; soloists: Peter Facer (oboe), Allan Meyer (clarinet), Adam Mikulicz (bassoon), David Evans (horn), Perth Concert Hall, 4 & 5 August 2017. WP. Sleepers Wake – Karalananga. Bernard Lanskey, World Classical Music Series, Royal Mirage Hotel, Dubai, 16 December 2016. ASP. Night Flight. Sophie Rowell and Kristian Chong, Melbourne Recital Centre, 2 May 2016. AP. Nocturnes and Variations. Stephen Emmerson, Conservatory Concert Hall, National University of Singapore, 17 February 2016. ASP. Prelude and Postscript. Antony Gray, Grieg Society of Great Britain – Schott’s Music Shop, London, 13 November 2015. EP. Nocturnes and Variations. Stephen Emmerson, Ian Hanger Recital Hall, Queensland Conservatorium, Brisbane, 28 October 2015. WP. Paradise and Prelude and Postscript. Halcyon, Io Myers Theatre, UNSW, Sydney, 17 September 2015. AP. Endling and Willow Bend. BBC Ulster Orchestra conducted by David Porcelijn, Ulster Hall, Belfast, Northern Ireland, 12-14 August 2015. EP. Gallipoli Symphony (includes August Offensive, large orchestra version). Istanbul State Symphony Orchestra conducted by Jessica Cottis, Hagia Irene Monumental Museum, Istanbul, Turkey, 4 August 2015. WP. Le Molière Imaginaire. I Fagiolini, Sydney Recital Hall (also Newcastle, Melbourne, Brisbane, Adelaide, Canberra, Perth), Musica Viva International Concert Series, 25 July – 8 August 2015. WP. Sound Lur and Serpent. Sydney Symphony Orchestra conducted by Vasily Petrenko, Concert Hall, Sydney Opera House, 22-24 July 2015. AP. Paradise. Felicitas Fuchs, Li-Wei Qin, Bernard Lanskey, La Longtaine, Montigny sur Loing, France, 8 June 2015. WP. August Offensive. Tasmanian Symphony Orchestra conducted by Garry Walker, Federation Concert Hall, Hobart, 27 March 2015. AP. St Peter’s Suite. St Peter’s Symphonic Winds conducted by Andrew Schultz, St John’s Cathedral, Brisbane, 2 August 2014. WP. Sound Lur and Serpent. 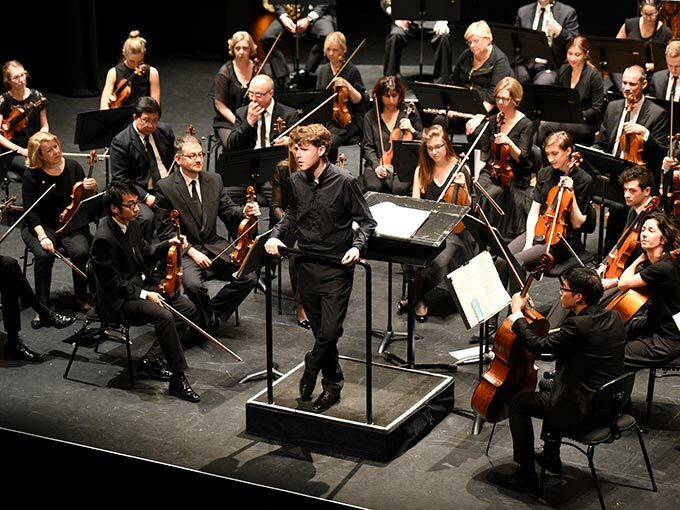 Sydney Symphony Orchestra conducted by David Robertson, Shanghai Oriental Arts Centre, China (also Jinan, Beijing, Xi’an, Hangzhou, Shenzhen, Guangzhou), 24 June–5 July 2014. WP. For more information on these performances, the website andrewschultz.net, has been updated and includes recent catalogue additions, press reviews and recording releases.